It's cherry season! Okay, yes, I know it's been cherry season for a while and that I'm quite late to the game, but better late than never, no? 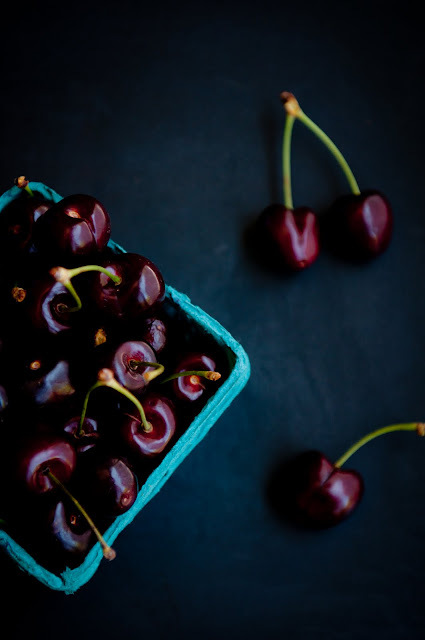 Sitting down to think about what pancakes could be made with the sweet, dark, and wonderfully juicy cherries that are gracing the farmers' markets these days, my thoughts almost immediately turned to one of my favorite cherry baked goods: corn cherry scones from Berkeley's Cheeseboard . If you are in the area, you must make a pilgrimage to Berkeley's Cheeseboard--right across from Chez Panisse!--for their baked goods: in the morning, there are hot-out-of-the-oven corn cherry scones, chocolate things, and cheese bread and in the afternoon, there's a line out the door and down the block for their famous Cheeseboard pizza. Recently, I took people on a tour of Berkeley, and of course we started out our day eating fresh-baked Cheeseboard bread with cups of steaming hot chocolate and tea on the sidewalk in the chilly summer morning sun. Ah, Berkeley. For my pancakes, I opted for fresh cherries instead of the dried ones that are studded throughout the Cheeseboard corn-cherry scones. 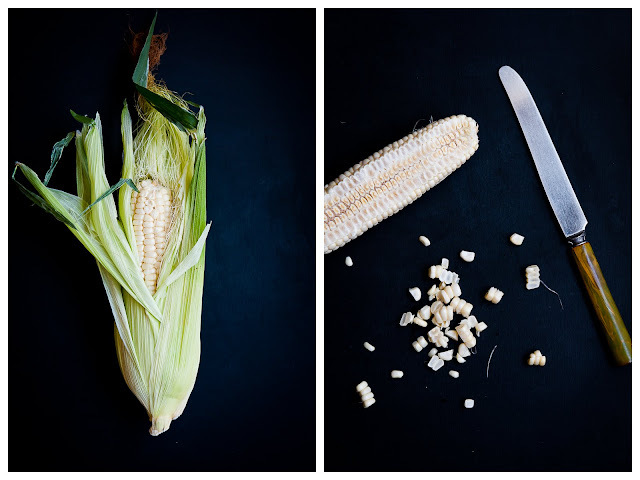 I also decided to add kernels of fresh-off-the-cob sweet white corn, which is also reaching the height of its season right now. 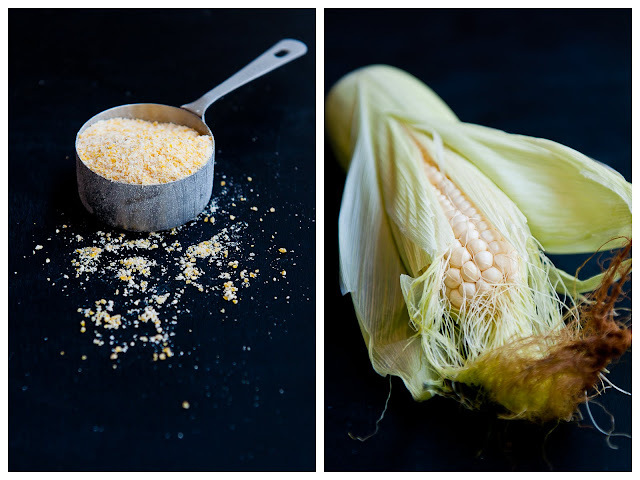 I really love the juicy, sweet, and milky kernels of corn that we get here in California, so I wanted to make full use of them while I can get them super fresh. 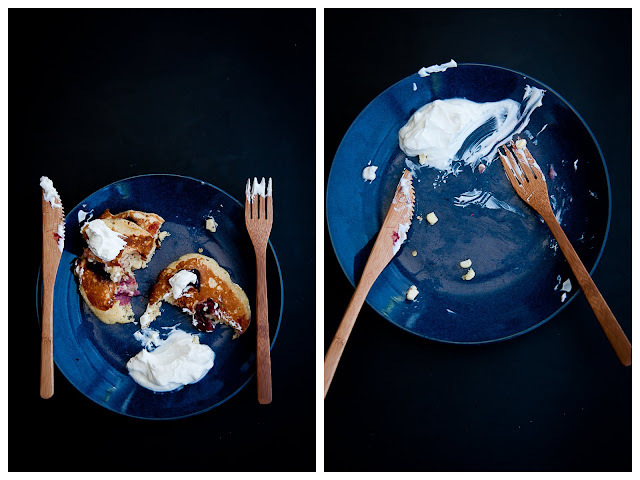 I have to say that I love the way these sweet corn cherry pancakes with sour cream turned out. 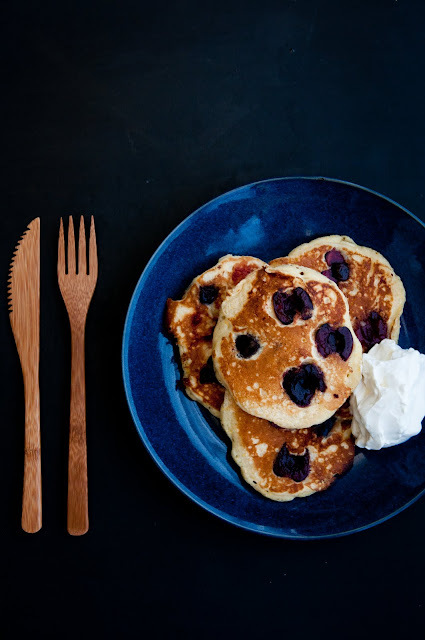 The cornmeal and crunchy kernels of fresh corn give these pancakes such an unexpected and fun texture, balanced out by the tart creaminess of the buttermilk in the pancakes and the sour cream on top (or creme fraiche, if you want to splurge! or have homemade lying about). 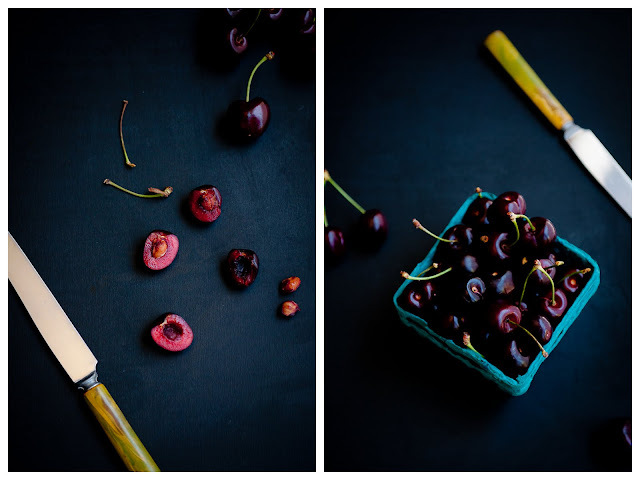 The plump cherries in each pancake also help to bring out the sweetness of the corn. Together, the combination of corn and cherries and cream make a great, hearty plateful for a summertime breakfast, especially perfect eaten outside on a crisp and bright Bay Area summer morning. More stone fruit to come! I am so loving and embracing the fruits and veggies of summer! 1. Combine buttermilk, eggs, melted butter, and vanilla extract in a bowl and whisk thoroughly. 2. Add the flour, corn meal, sugar, baking powder, and salt and mix until smooth. Batter should be thick and just barely runny, but if it's too thick and difficult to stir, thin it with a tiny dash of buttermilk. 3. Mix the corn kernels into the batter. 4. Oil lightly a medium hot skillet. Cook the pancakes slowly over medium heat. 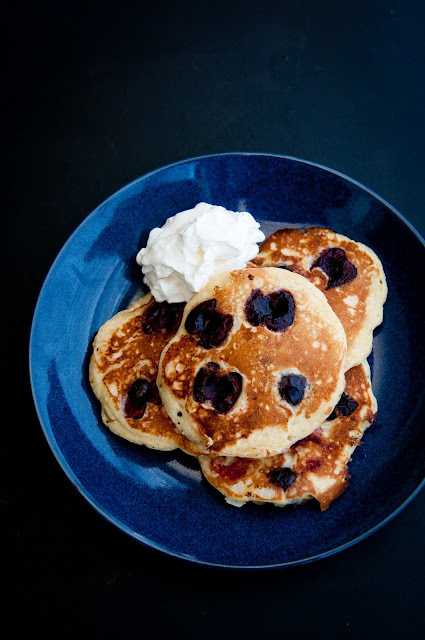 When cooking the pancakes, place a few cherry halves in the batter immediately after you pour it onto the skillet. 5. Serve with a generous mound of sour cream or creme fraiche. Do I sense breakfast for dinner after reading this? Um hell yeah! Awesome recipe! This looks great, I have never had sweet corn pancakes! Great post, thanks for the idea! MMM!! cherries, unfortunately they're so expensive here. To be honest though I've never heard of the dried cherries you speak off..
@Iris: dried cherries are great--you should try to track some down if you can. To prevent my batter from getting stained, I waited until I put the batter down into the pan to add the cherries in. Love these photos, Steph! And the pancakes look to die for as well. I used to love getting either the cream of wheat or cornmeal pancakes at IHOP and was sad when they stopped making each of those! I love pancakes~ these look delicious! Your blog is one of my favorite eye candies. These pancakes look phenomenal! Nothing like fresh cherries in a baked good to start your morning :) I also love the idea of mixing in fresh corn kernels!